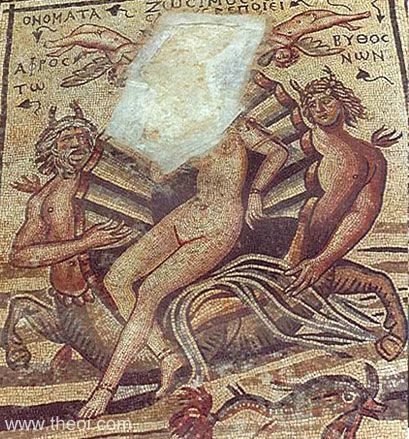 The goddess Aphrodite is carried across the sea in a cockle-shell by a pair of Ichthyocentaurs (fish-tailed centaurs) following her birth from the sea-foam. A pair of infant love-gods, Eros and Himeros, sommersault in the air above her head. The marine deities have the upper bodies of men, the lower foreparts of horses, and the tails of fish, and are each crowned with a pair of crab-claw "horns". The two figures are labelled Aphros (Sea-Foam) and Bythos (Sea-Depths) in Greek.